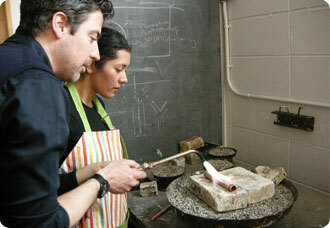 Jonathan Wahl, director of the jewelry and metalsmithing program in the 92nd St Y's School of the Arts helps a student in the silversmithing class. The 92nd Street Y was founded in 1874 and its School of the Arts, which began in 1930, has been a seminal part of New York’s craft education for decades, even training artists under the GI Bill. 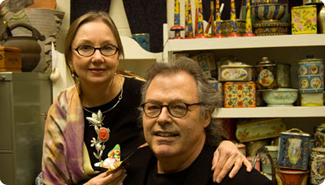 The 92nd St Y classes and workshops are taught by professional artists - such as Jonathan Wahl, Director of the Jewelry & Metalsmithing Department and Bobby Silverman, Director of the Ceramic Center - and are available for all age groups and all levels, from children to senior adults, from hobbyists to accomplished artists who come to learn new skills. Julie Chen is a Book Artist who lives in Berkeley, CA. After completing a degree in printmaking at the University of California, Berkeley, Chen became intrigued by the language, equipment, and materials of Book Arts and entered the Book Arts program at Mills College. 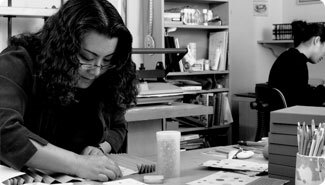 Book Arts encompass binding, letterpress, printing and printmaking, combined with three-dimensional art. The finished products are unique three-dimensional pieces of art that include text. Cary Esser is a ceramic artist who works in Kansas City, Missouri. She creates architectural tiles and terra cotta details using the language of architectural ornament to interpret human culture and the natural world. Esser received her BFA from the Kansas City Art Institute and her MFA from the New York State College of Ceramics at Alfred University. 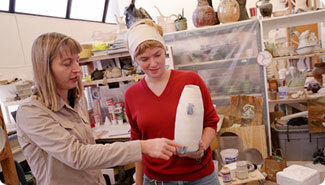 She is currently Professor and Chair of the Ceramics Department at the Kansas City Art Institute. Her work can be found in the collections of the Archie Bray Foundation and the John Michael Kohler Art Center, among others. 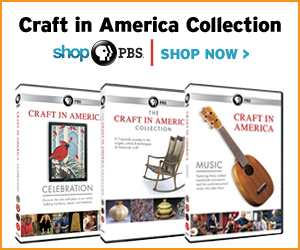 Kansas City Art Institute is a four year college of arts and design in Kansas City, Missouri. KCAI offers the Bachelor of Fine Arts degree, in which a comprehensive liberal arts program is complemented, in 14 programs including ceramics, fiber, and printmaking. 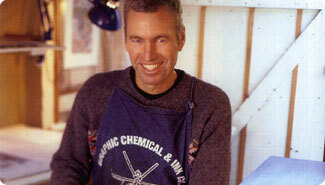 Ken Ferguson served as the chairman of the ceramics department from 1964 to 1996. 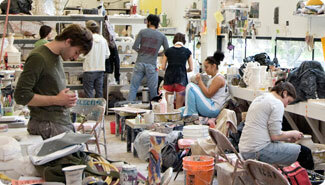 Many prominent and influential figures in contemporary ceramic arts have graduated from the ceramics program. Nikki Lewis is a ceramic artist who works in Los Angeles, California. “I like to get dirty,” she says, explaining her long-standing love for making all things clay. She throws exquisite delicate functional work that feature intricate handles, fluted lips, and painterly glazes. 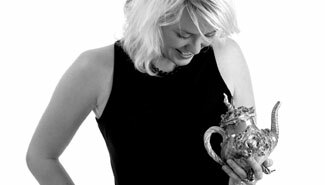 Nikki teaches at the Cahuenga School of Pottery, Oakwood School, and is a lecturer at California State University Northridge, California State University Los Angeles, and Mt. San Antonio College; she received her B.F.A. from the Kansas City Art Institute and M.F.A. from the University of California, Los Angeles. 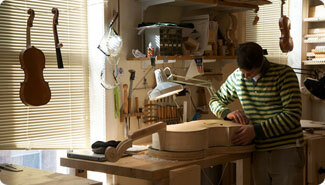 North Bennet Street School has been training people for employment in the crafts since 1885. NBSS is unique in training students for careers in areas as diverse as bookbinding, cabinet and furniture making, carpentry, jewelry making and repair, locksmithing, piano technology, preservation carpentry, and violin making and repair – all traditional trades that use hand skills in concert with evolving technology. Dave and Roberta Williamson are jewelers who live in Berea, Ohio. The Williamsons create jewelry that combines ephemera and found objects, some of which has been passed down in their families, and others found at the many flea markets and antique shows they frequent. Working as true partners in the process, Dave brings the technical skills that complement Roberta's creative combinations of art and design. Part of their own lives goes into each of these talismans and the story they tell is interpreted and re-invented by the wearer. Through classes they teach locally, students are encouraged to "find their own stories" and build a piece of jewelry that captures and envelops an emotional moment or memory dear to their own lives.